Heat oven to 350°F. Spray 1- to 1 1/2-quart casserole with cooking spray. In 2-quart saucepan, melt butter over medium heat. Add onions; cook and stir 2 to 3 minutes or until tender. Stir in flour, salt and pepper. Gradually add milk, stirring constantly. Cook and stir until mixture is bubbly and thickened. Remove from heat. Add 3/4 cup of the cheese; stir until melted. Stir in cooked vegetables. Spoon mixture into casserole. Sprinkle with crushed crackers and remaining 1/4 cup cheese. Bake 25 to 30 minutes or until topping is golden brown and casserole is bubbly. 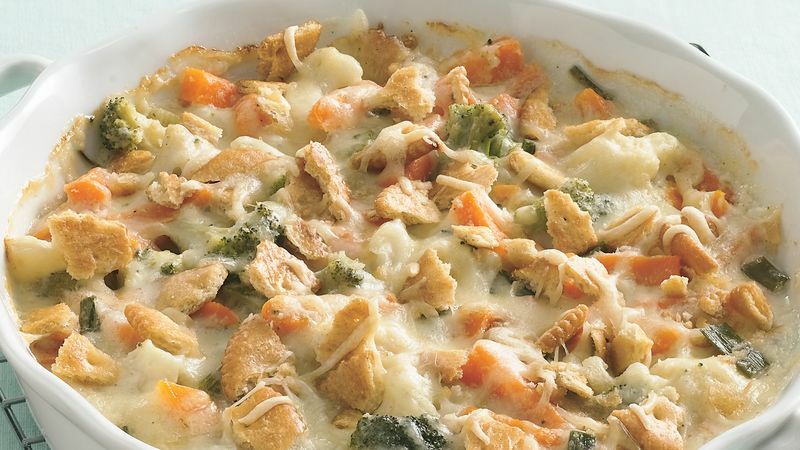 To lower the fat in this casserole by about 2 grams per serving, use skim milk and reduced-fat Swiss cheese. To make ahead, prepare this casserole as directed, reserving the crushed crackers. Cover and refrigerate up to one day. Then, sprinkle the casserole with the crackers and bake it for 30 to 40 minutes.